Thirty Russian lesbian, gay and bisexual activists foiled the police and FSB security services by holding a 10 minute flashmob Gay Pride march on one of Moscow’s major thoroughfares, Leningradsky Street, this afternoon, Saturday 29 May. “The guerrilla-style hit-and-run Moscow Gay Pride march was over before the police arrived. When they turned up, officers scurried around aimlessly, searching for protesters to arrest. All escaped the police dragnet,” said British gay human rights campaigner Peter Tatchell, who joined today’s parade to support the Russian gay campaigners. “All morning the Gay Pride organisers fed the police a steady stream of false information, via blogs and websites, concerning the location of the parade. They suggested that it would take place outside the EU Commission’s offices. As a result, the police put the whole area in total lockdown, closing nearby streets and metro stations, in bid to prevent protesters assembling there. “This was the fifth Moscow Gay Pride and the first one with no arrests and bashings. It was also the first time activists succeeded in staging an uninterrupted parade. “The Russian gay activists have won a big political and morale victory. They staged their Gay Pride march, despite it being banned by the Mayor and the judges, and despite the draconian efforts by the police and FSB security services to prevent it from taking place. I pay tribute to the courage and ingenuity of the Russian gay and lesbian activists. They outwitted the Mayor and his police henchmen. “Today’s events felt like steeping back into the Soviet era, when protests were routinely banned and suppressed. It is madness that Russian gay rights campaigners are being treated as criminals, just like dissidents in the period of communist dictatorship. “The real criminals are not the peaceful Gay Pride protesters but the Moscow Mayor and judges who banned this protest. They are the law breakers. They should be put on trial for violating the Russian constitution. “Western ambassadors to Russia offered no support to the Moscow Gay Pride organizers. 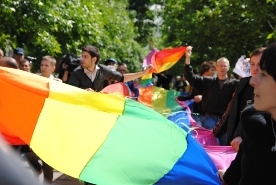 They ignored suggestions that they host Gay Pride events in their embassy grounds and that they fly the gay rainbow flag on Moscow Pride day, 29 May. “In a shameless display of feeble deference to the Mayor of Moscow, a court in the Russian capital upheld Mayor Luzhkov¬¬’s ban of the fifth attempted Moscow Gay Pride parade. The judge acted in defiance of the Russian constitution, which guarantees freedom of expression and the right to protest. “This is a sad day for Russian democracy. It is the latest of many suppressions of civil liberties that happen in supposedly democratic Russia. Many other protests are also denied and repressed, not just gay ones. Autocracy rules under President Medvedev and Prime Minister Putin. “This is much bigger than a gay rights issue. We are defending the right to protest of all Russians – gay and straight. “The courage and resolve of the Russian LGBT activists is inspiring. They were ready to take whatever brutality the police threw at them,” said Mr Tatchell.